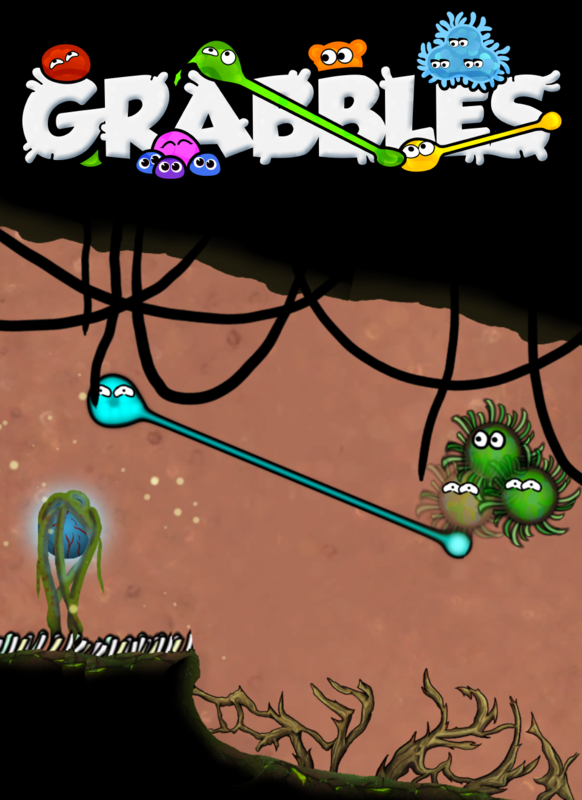 Grabbles is a chaotic, fast paced combat platformer with a twist. Each grabble is equipped with two sticky appendages that they depend on to survive. A steady hand and quick reflexes will determine your fate in the local and online multiplayer arenas. We recently exhibited our game at PAX East. It was our first convention, and we learned a lot. Each member of our team wrote separate post-mortems when we got back from PAX to provide as many different perspectives as possible. Then a few days ago we wrote up a little bit about our failed Kickstarter and where we are now with Grabbles. We talk about the costs and there's graphs and everything. When we initially decided to exhibit at PAX East we had planned to go as part of Indie Megabooth. Unfortunately they didn't accept us and we didn't find out until after normal registration was closed. They were kind enough to add us to a waiting list though in the event a spot opened up. At this point we were pretty sure we weren't going to be able to attend. Fast forward to a month before the event and we find out that there actually are some open slots and we have to decide if we want to take one or not. We knew we wouldn't have much time to prepare, but we just had to give it a shot. It turned out to be an amazing experience, but there was a lot of stress involved and a few important lessons learned. We're still not sure if it was worth it or not, but we can all agree that we're glad we did it. We are from DeLand, Florida (just outside Orlando). PAX East is in Boston. Add in stops for 7 people to the mix, and you're looking at a 28 hour drive in a van with 8 seats. Attempting to sleep sitting up in a van seat for a whole day is a bit rough.Probably the biggest mistake we made was not launching our Kickstarter and Greenlight before the first day. We really messed up on this one and ended up having to drop off our media guy, Brent, in the middle of Boston and basically said "Find stable internet, launch our Kickstarter." He was not very happy and eventually made it back to the convention center but we could have handled it all way better. Don't make a ton of last minute changes that will be "just perfect" for the convention. Talk to everyone, also approach everyone who even looks remotely interested in your game. Become a landmark by putting a large object in the air. Maximize the amount of people that can play your game in the space provided. It's OK for people to be in the aisles, just not your stuff. Perfect an introductory level / talk for your game. Have something fun and informational to pass out. Take shifts when working the floor. Wear interesting things and people will take interest. Address labels are cheap custom stickers. 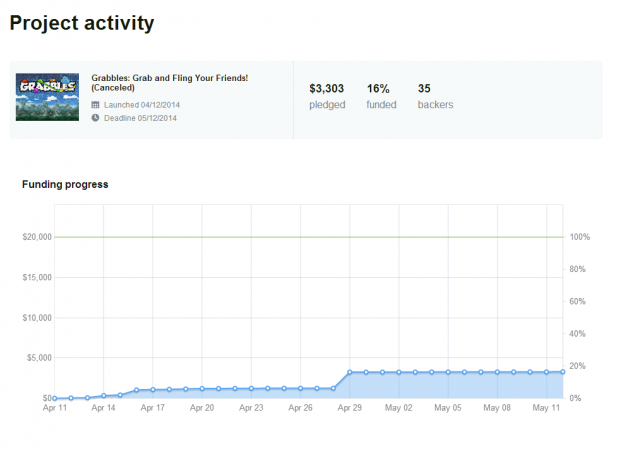 After running our Kickstarter for 30 days and ending on May 12th we gathered $3,303. At least $2,638 was from confirmed friends and family. 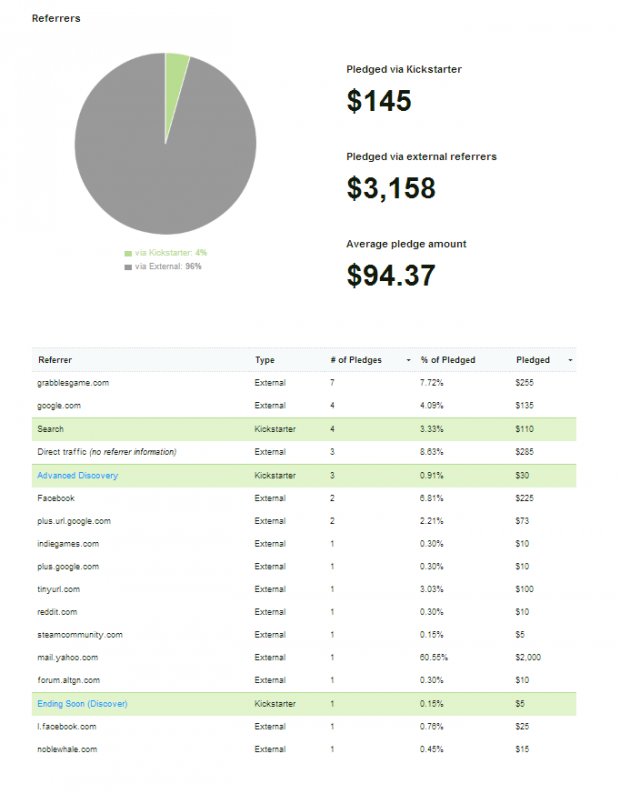 This gives us a total of $665 from just us being a good game that people wanted to happen. With our $20,000 goal, we have failed. One clear fault that we can point to is not having any fan base at our launch. We launched in the middle of the PAX East weekend while at PAX East. We also didn't have much as far as advertising materials. We had one video, a few screenshots, and a few gifs. In the two months since we released the demo we've had over 10,000 unique players finish at least one level thanks mostly to the free-to-play sites. We also had a Russian youtuber find us on Kongregate and release a video that has turned out to be our most popular video yet with over 8,000 views and climbing. 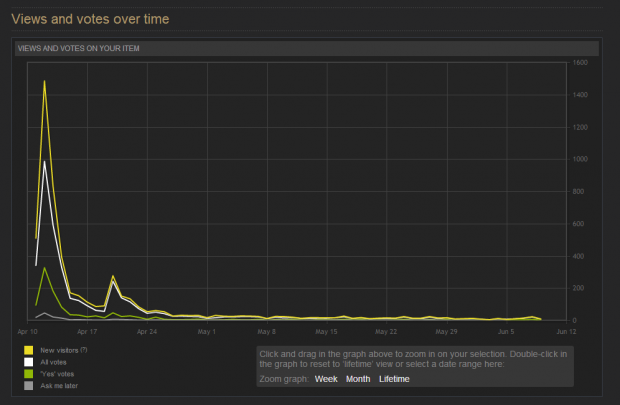 We've see no discernable difference in our Greenlight because of it though. 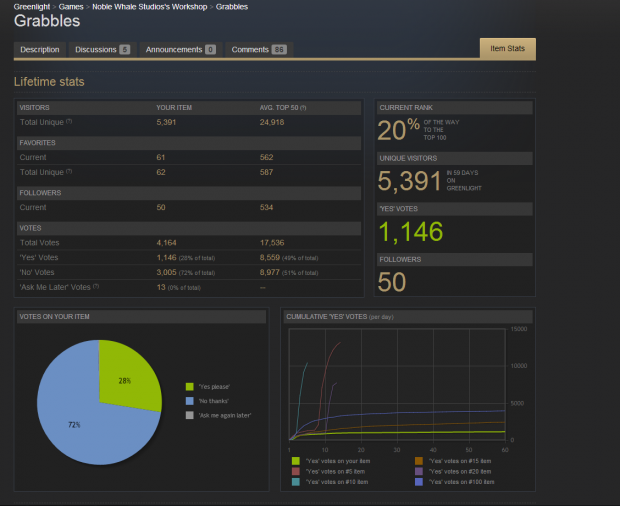 PAX East was amazing, but it did not have the influence on our Kickstarter or Steam Greenlight that we had hoped for. We're working on focusing our effort more on building a fan-base and spreading the word. Hopefully once we've generated some more buzz we can do a smaller and hopefully more successful funding campaign. I'm sure we missed some things and none of us have written anything in awhile so if there's anything else you want to see on here feel free to leave comments, suggestions, and questions. Back from PAX East. Demo released. Kickstarter and greenlight launched! Boss, Co-op, Same Screen Multiplayer added! Boss added, Co-op added, Same screen multiplayer added. Grabbles will be exhibiting at PAX East! Come see us at booth #1169! Grabbles demo soundtrack released for free on bandcamp. what happened to the old download link? The download link is not working right now. It looks pretty cool.